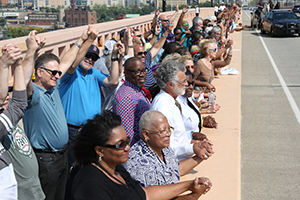 Mayor Frank G. Jackson and the Department of Community Relations held its Hands Across CLE event on the Lorain-Carnegie Bridge. The Board members represent Cleveland's racially, ethnically, and religiously diverse population. Members include Mayor Frank G. Jackson, Chairman; and Rev. Dr. Charles Lucas, Co-Chair. The board meets monthly to protect individual’s civil rights and to promote peaceful relations among and relieve tension between cultural groups. The Board is responsible for forming and maintaining positive relationships between residents, businesses, organizations and faith-based institutions. To reach this goal, the staff organizes street and block clubs and community meetings. In addition, the Board plans the Mayor’s Neighborhood Tours, when the Mayor and his staff walk through the City addressing residents’ questions or concerns directly. The Board improves relationships by working through cross-cultural struggles and promoting multicultural harmony. Relationships are promoted through education and outreach to build understanding between different languages and cultures. The Board provides mediation services to parties referred by its staff, community agencies, Cleveland Division of Police, City Council, City Prosecutor’s Office, or the Mayor’s Action Center. When a referral comes in, a CRB mediator completes the intake process and a mediation date is scheduled. During mediation, parties try to agree on common grounds. The mediator remains neutral, assisting both parties to come to an agreement. It is the parties alone who decide on the agreement. If agreement is reached, it is put in writing and signed. The Board will later contact the parties to check on compliance. The Board promotes cooperation between police and residents through training, neighborhood meetings, block and street club development and court watches. In addition, safety fairs with agencies such as Weed and Seed groups, Community Development Corporations and faith and community-based groups are held and the Board hosts the Annual Mayor’s and National Nights Out Against Crime. Each police district and the downtown neighborhood have monthly meetings chaired by a civilian co-chair and district commander.